Life with Lucy, David and Vivian: Rise and Shout! 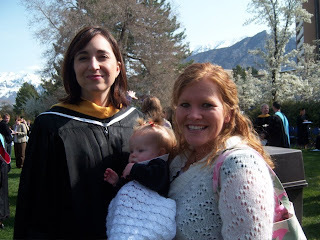 Mommy took me to my 1st BYU Graduation (well at least my 1st one outside of my Mommy's tummy)! By the way, this is why she is writing in blue today. Anyway, I got to meet lots of her awesome students and see the yummy mint brownies. Mommy didn't get to wear her cool robes because she was afraid I'd spit up on them. Congrats! I miss it, a little! I find myself not wearing stuff all the time because Brigham is a spitter upper too! I can't believe we missed each other! Lucy is so adorable!! Lets have a playdate so she and Quintin can meet! Reason # 483 Why My Daddy is Amazing . . . I Love This Picture . . .
Daddy's New Toy . . . When You Laugh, The World Laughs With You . . .
Oh the Things We Pass On . . . This Is My New Toy . . .
Boston, Some Wicked Awesome Fun! Happy April Fool's Day Everybody!